Victor Olofsson Hat Trick Delivers Revenge and Free Burritos · Let's Go Amerks! 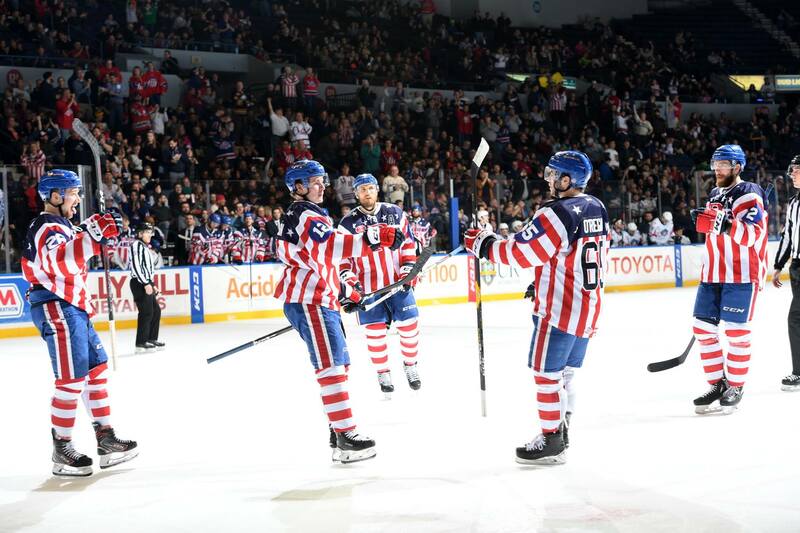 There’s times when everything goes better than expected and that’s what happened on Friday night when the Rochester Americans delivered a 7-1 defeat to the Springfield Thunderbirds while wearing the classic stars and stripes jerseys for Hall of Fame night. Springfield and Rochester played each other once earlier in the season when Springfield scored seven goals in the second period. The game ended with Springfield winning 9-4 and embarrassing the Amerks on the road. Friday night it was time for revenge and that’s what happened with five goals in the third period for Rochester. The night started with both teams on their benches for the Amerks Hall of Fame inductions to listen to Doug Janik (current Springfield assistant coach) and Steve Langdon give their speeches. Due to the ceremonies the game started a little later than usual but there wasn’t anyone on the ice that was going to complain. The first period was scoreless, almost even in shots, and both teams having to kill off two penalties each. It was physical game right from the start and as the game went on continued to favor the home team. Scott Wilson scored the first goal at 8:12 of the second period redirecting a shot from Matt Tennyson into the net. Victor Olofsson earned his first of four points of the night with an assist. Just over four minutes later Danny O’Regan and Rasmus Asplund put on a clinic along the boards on how to win the classic 50/50 battle that’s often spoken of. Danny O’Regan skated away with the puck behind the net and was able to deliver a perfect pass to Victor Olofsson in front of the net who buried a one timer. Knowing the final score will make this next line seem outrageous but during the game itself a 2-0 lead going into the third period wasn’t anything to get too excited about. There’s been five other games this season where the Amerks have had a lead going into the third period and ended up losing. “We talked about it between the second and third that it was a zero zero game for us,” Chris Taylor said afterwards. It only took 93 seconds into the third period for Victor Olofsson to score his second of the game on the power play with another assist from Rasmus Asplund. A short 77 seconds later another goal was scored this time by Wayne Simpson from Kevin Porter and Matt Tennyson. The 4-0 lead only 2:50 into the third period almost felt comfortable. Springfield has the leagues best power play so when they had a five on three opportunity they weren’t going to hold back. It didn’t work out for them. A pass to the point was intercepted and poked away by Danny O’Regan to Rasmus Asplund. As they went down the ice on a short handed two on one there was a pass attempt made by Asplund to O’Regan but it ended up being pushed into the net by Springfield defenseman Jacob MacDonald. Wayne Simpson gave a reach to give a puck a back handed whack as it entered the Amerks zone which sent the puck flying down ice. Victor Olofsson took off winning the race for the puck and scored 41 seconds after Asplund to put the Amerks up 6-0. Defense leads to offense which leads to having fun. There was one goal scored against Rochester but when you win by six it’s barely worth mentioning. Burritos were on the mind of not only the fans but the team itself. What he’s referring to is a promotion with Moe’s Southwest Grill that when a Moe’s hot player completes a hat trick everyone with a coupon gets a free burrito. If you’ve been to an Amerks game this season and have one of the handouts you’ll have a coupon on the back. Victor Olofsson finished the game with three goals and one assist for his first professional hat trick. Unfortunately there was about as many hats on the ice as points. Here’s the team highlights of the game below. Gifs and tweets will be added Saturday.